We manufacture, Export and supplies Boiler Antiscalants Liquid for variety of boiler and various operating pressure. 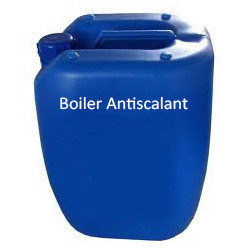 Our Boiler Antiscalants Liquid is made from refined raw materials, latest manufacturing techniques and modern machines to ensure reliability of the product for the suitable application. We are manufactures of Boiler Antiscalant Liquid which is an online boiler cleaning compound which assist a complete boiler internal treatment. The optimum balance of products enable inhibition of calcium, iron and iron-oxide deposition, removal of existing scale from the water boiler, sludge conditioning, poly-phosphates and polymers for scale and corrosion inhibition. Boiler Antiscalant comprises of corrosion inhibitor which forms a protective passive film over the boiler heat transfer surface. The inhibitor prevents contaminating due to Iron Hydroxides, pitting and tube failures. It has also established itself to be among world’s renowned Boiler product exporter having its facility in India. Beverage & Brewery, plastics and oven sacks ,leather and rubber, iron and steel, power station, heavy engineering industries, atomic energy, petrochemical & refineries and cement, glass and ceramics industries etc.